Hiya guys! I'm still catching up from being sick last weekend... I feel like I need to post a health update at some post. But let's not even think about that when we have so much Fall gorgeousness all around us right now.... in polish form of course. Today I'm sharing the Fall Classic Cremes Collection by Tux Polish, which consists of five basic creme shades. And be sure to read until the end of the post to see how these stamp! The Fall Classic Cremes Collection by Tux Polish is now available for purchase. Each full-size (10 mL) bottle retails for $9.50 and the complete collection retails for $46.00. 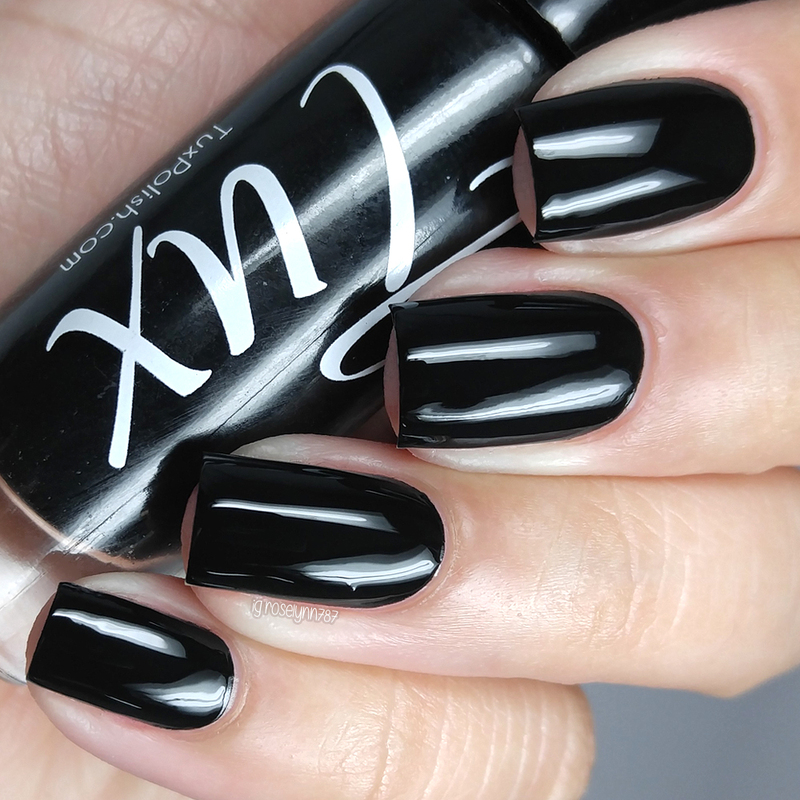 Onyx can be described as a black creme. Ever since Tux Polish released Pure, a white one-coat creme polish, I have been anxiously waiting for a black creme. My wishes have now been granted with this perfect black. The formula has a great balanced consistency, not too thin or too thick. And like most of this collection, it has completely opaque full coverage in one coat. It also dries on its own to a very high shine. Shown in one coat and sealed with a glossy topcoat. Cranberry Salsa can be described as a berry pink cream. Shown in one coat and sealed with a glossy topcoat. School Daze can be described as a dusty purple cream. Shown in one to two coats and sealed with a glossy topcoat. Fall Fest can be described as a bold red-toned orange. Borderline coral shades such as this one don't normally complement my skin tone, but there is always an exception. This one is definitely one of mine! Shown in one to two coats and sealed with a glossy topcoat. Autumn Air can be described as a deep teal cream. Shown in one coat and sealed with a glossy topcoat. And as I mentioned at the beginning of the post I had to test and stamp these cremes for you! 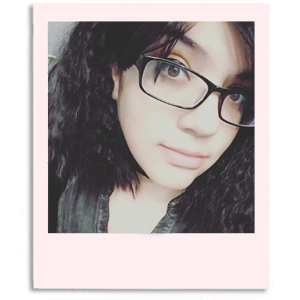 I went ahead and tested these over black and white, so let's take a look! Overall words cannot describe how impressed I am with these cremes! I always expect great formulas from Tux Polish, but these have definitely surpassed the quality of her previous cremes. And that's saying A LOT. These are definitely the most pigmented cremes that Tux has created to date. Because of that they stamp flawlessly even over black, which I was not expecting. Highly recommend Onyx if you're searching for the perfect one-coater black. I know sometimes you guys are on the fence about cremes, but these are a great addition to any collection. Especially for those of you who like to dabble in some nail art and watermarbles! 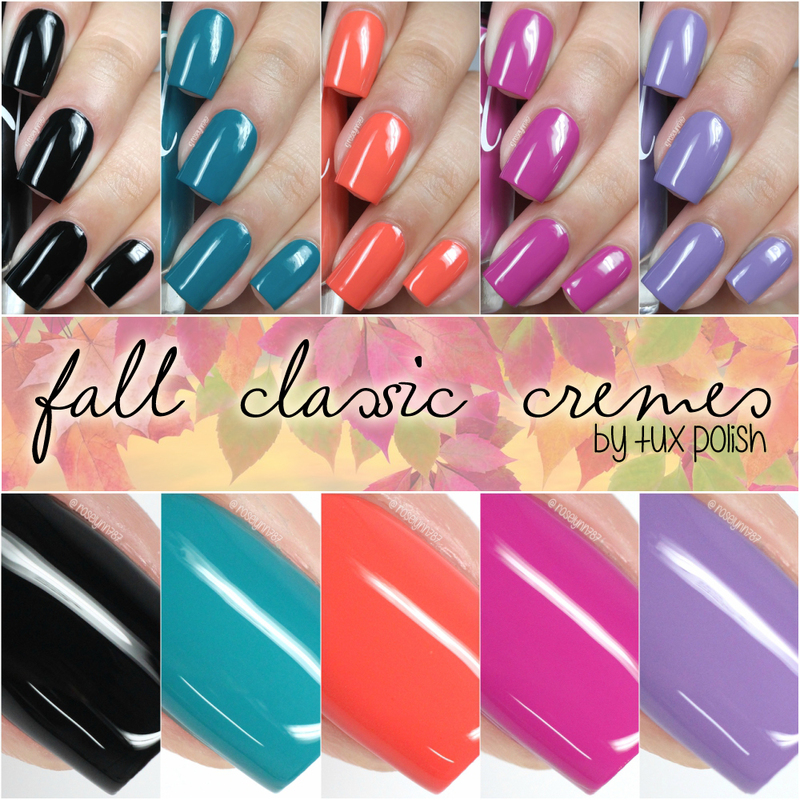 To recap, the Fall Classic Cremes Collection by Tux Polish is now available for purchase. Each full-size (10 mL) bottle retails for $9.50 and the complete collection retails for $46.00.